Wunderlist To-Do Manager for Windows 7 released | ComTek Computer Services Inc. 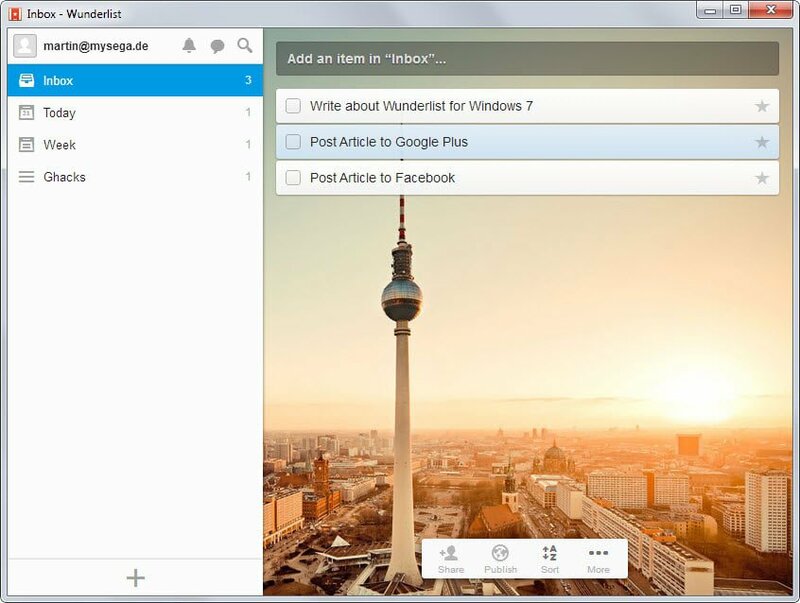 If you are using the to-do manager Wunderlist on a mobile device or the web you may find it interesting that it has been published for Windows 7 today. The program brings the full experience to the Windows desktop and while the program looks like it is only a wrapper for the web interface, it runs quite well. This is not the first version for Windows though. If you are running Windows 8 you may know that you can download and install the Wunderlist app from Windows Store as well. The app requires that you sign in after you run the program locally. You can create a new account if you don't have one already. If you sign in with an existing account all information are displayed in the program after sign in. The program uses the same layout as the web interface. The left side displays date and task related groups, the right all items that have been added to the group that is selected currently. New items are created with a click on the box, some typing and hitting enter. Each entry is displayed directly afterwards with options to mark it as complete or favorite it directly. Additional options are provided on a right click. Here you can create a new group from the item, email or print the selected item, move it, or create a so-called Wunderlist link. This right-click menu is the only difference between the Wunderlist program for Windows and the Wunderlist web application. The very same options are listed at the bottom of the program window again. The only options missing in the right-click menu are sort and to email or print a list instead of individual items. The program supports shortcuts that can speed things up for you. A tap on Ctrl-n creates a new item for example while Ctrl-d marks the selected item as completed automatically. Apart from that there are also options to change the background of the program, to change email or password, modify notification options and configure smart lists behavior. If you are using Wunderlist already and use a Windows computer running Windows 7 at times, then you may find Wunderlist for the desktop useful. With that said, its account requirement may not be for everyone, especially not for Windows users who don't want data to by synced across devices. If you are looking for alternatives try TickTick or Todoist.